The 1.1 kg stone of the Tissint Martian meteorite at the Natural History Museum, London. The stone has a glossy black fusion crust. The fresh interior shows the large yellow/green olivine macrocrysts and pockets of black glass which are characteristic of this shergottite. Rocks are occasionally blasted off the surface of Mars by cosmic impacts from asteroids. These drift in space, with some crashing down on Earth. Martian rock known to be on Earth is very rare: only about 220 pounds (100 kilograms) worth. Last July, a swarm of Martian meteorites plunged into the Moroccan desert. These rocks, named Tissint meteorites after the village they landed near, were the first batch of Martian meteorites to be collected right after observers witnessed their fall. All the other Martian meteorites, many of them recovered from Antarctica, had been gathered well after arrival, during which time degradation and contamination may have obscured secrets they held about Mars. The black glass resulted from melting, probably caused by the impact that knocked the rock off Mars an estimated 700,000 years ago. The meteorite is mostly a kind of volcanic rock known as basalt, rich with an olive-green crystal known as olivine. This suggests it once was part of Mars' interior. However, levels of sulfur, fluorine and trace elements such as cesium hint at material from the Martian surface. In addition, the glass contains bubbles of Martian atmosphere. The author checking a complete piece of Tissint meteorite (south of Morocco). To explain the presence of the interior, surface and atmosphere of Mars in one meteorite, the researchers suggest the rock's cracks and fissures were infiltrated by fluids washing down from the Red Planet's surface. "It was really surprising and very exciting to find the evidence of Martian surface alteration in Tissint," lead study author Hasnaa Chennaoui at Hassan II University in Casablanca, Morocco, told SPACE.com. "We didn't expect this result." 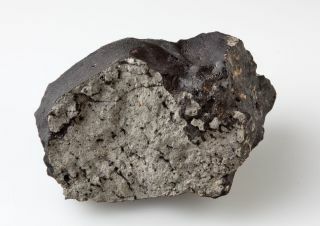 The meteorite possesses certain varieties (isotopes) of helium, neon and argon that were likely formed by collisions with the high-energy-charged particles of cosmic rays. The isotopes reveal the rock spent about 700,000 years in space. This makes the Tissint rocks roughly the same age as three-quarters of all known Martian meteorites, suggesting they all got knocked off Mars by the same event. The scientists detailed their findings online today (Oct. 11) in the journal Science.